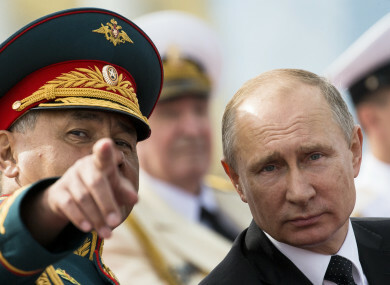 Russian President Vladimir Putin, right, listens to Defence Minister Sergei Shoigu . PRESIDENT VLADIMIR PUTIN yesterday said the United States would have to cut 755 diplomatic staff in Russia and warned of a prolonged gridlock in its ties after the US Congress backed new sanctions against the Kremlin. Putin added bluntly that Russia was able to raise the stakes with the US even further, although he hoped this would be unnecessary. A US State Department official denounced the move as a “regrettable and uncalled for act,” adding that Washington was now weighing a potential response. On Friday, the Russian foreign ministry demanded Washington cut its diplomatic presence in Russia by 1 September to 455 people — the same number Moscow has in the US. “More than a thousand people — diplomats and technical personnel — were working and are still working” at the US embassy and consulates, Putin said in an interview with Rossia-24 television. The US State Department would not confirm the number of US officials serving at the mission. We have waited long enough, hoping that the situation would perhaps change for the better. But it seems that even if the situation is changing, it’s not for any time soon. Putin warned that Russia could further ratchet up the pressure, but he hoped this would not be needed. Russia still “has things to say and is able to further restrict areas of common activities, which may be sensitive for the American side,” he said. If the damage inflicted by “attempts to pressure Russia” rises further, “we are able to look at other forms of retaliation. But I hope we won’t have to do it,” he said. “For the time being, I am against” any additional riposte, Putin said. On Thursday, the US Senate overwhelmingly approved a bill to toughen sanctions on Russia for allegedly meddling in the 2016 US presidential election and for its annexation of Crimea in 2014. Iran and North Korea are also targeted in the sanctions bill. The law now goes to President Donald Trump who had made an improvement in ties with Russia a plank of his election campaign — a position that his critics said was inexplicable. Russia also froze two US embassy compounds — a Moscow summer house and a storage facility in the city — from August 1. “I thought that we should show that we too are not going to stand by without a response” after “the baseless measures taken by the American side,” Putin said. In December, then US president Barack Obama ordered out 35 Russian diplomats and closed down two embassy summer houses that Washington said were being used by Moscow for espionage. At the time, the Kremlin said it would put any retaliation on hold until after Trump took office. High on the list of US grievances is the allegation that Russian operatives hacked Democratic Party computers at the peak of the troubled 2016 election campaign. Putin on Sunday said Russia had proposed “several times establishing cooperation with the American side” on cyber-security. “But instead of starting to work constructively, all we hear are baseless accusations about interference in the internal affairs of the United States,” he complained. Putin and Trump, meeting on the sidelines of the 7-8 July G20 summit in Hamburg, talked about setting up what Trump called an “impenetrable cyber security unit” to prevent hacking in future elections. Senior members of Trump’s Republican Party poured scorn on the concept. Email “Vladimir Putin says more than 750 US diplomatic staff will have to leave Russia ”. Feedback on “Vladimir Putin says more than 750 US diplomatic staff will have to leave Russia ”.